Happy Wednesday - the first day of Spring! 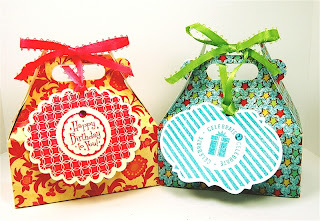 Today I want to wrap up the story of the gift boxes and share some sale news. 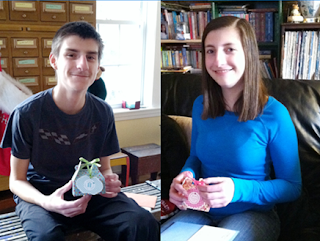 ...we went to the birthday celebration last weekend and delivered the gifts to our niece and nephew. I managed to take just a few photos - some with my phone and some with a camera and I decided to make a quick digital page. I use the Creative Memories StoryBook Creator 4.0 program for my digital scrapping. I started with a blank page and set up some photo spots. 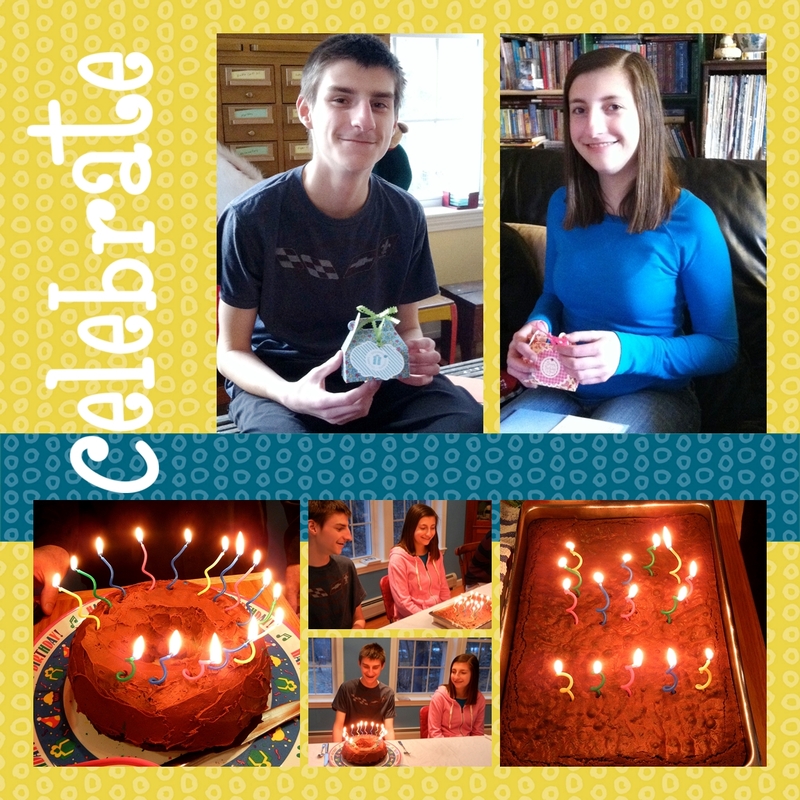 I knew that I wanted to make the photos of our niece and nephew with their gifts the largest and I also wanted to show the cakes with the curly birthday candles and the photos of the moments just before they blew out the candles. This was my "rough draft" page. I chose some papers from the Be Young Digital Kit and added a stripe across the page. 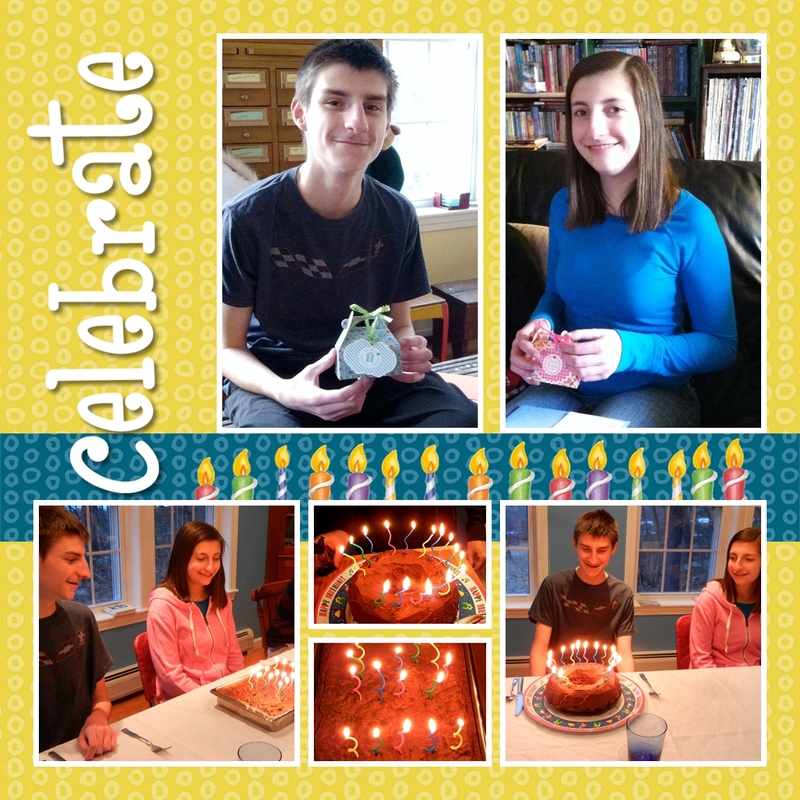 I like the spacing of the photos on this version but I realized that the cakes were too prominent so I switched the images around. This is one of my favorite things about digital scrapping - you can try lots of variations and change the images many times until you settle on a final version. Here you can see the difference after I made some changes. The smaller photos of the cakes still show off the curly candles and the larger photos make it easier to see their faces as we all sang the birthday song. I also added a thin white mat around each photo to frame them on the busy background. The "celebrate" is from the Color Me Happy Digital Kit and I added a shadow to make it stand out more. The 15 birthday candles are from the Classic Celebration Digital Embellishments. I wasn't completely happy with the color of the background paper so I tried different shades using the "adjust hue" control on the color tab. 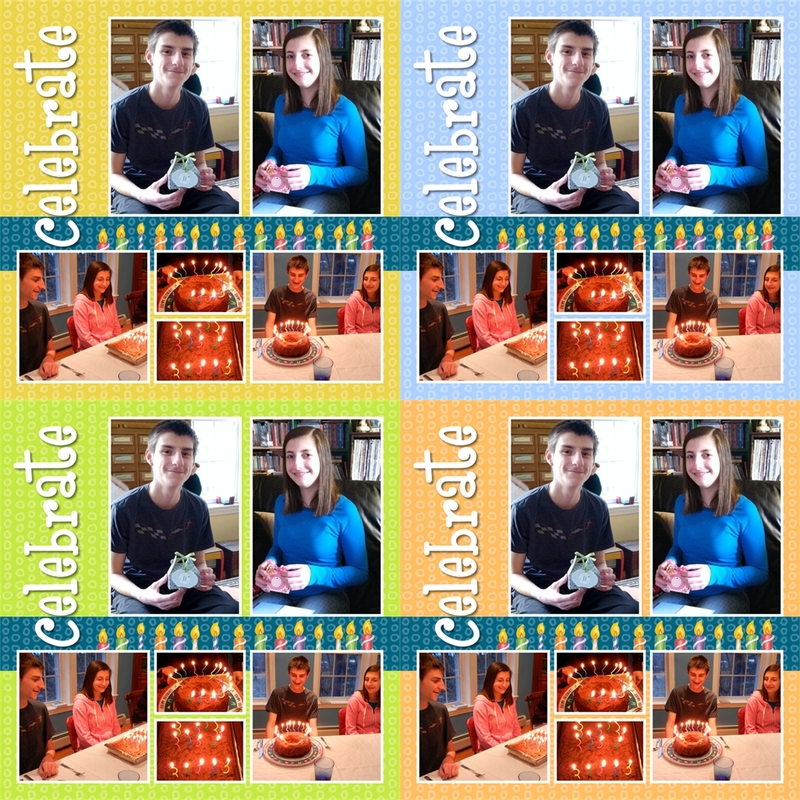 Digital paper is so versatile - I was able to create several different background colors using this feature. My favorite two colors are the ones on the right side of the composite image above and I finally settled on the blue version. I didn't add any journaling on this page - I usually do double page spreads and I will probably add a few more photos on the second page and add the information about the day's events on that page. I enjoy playing with paper and making cards and other projects but I find that I appreciate the flexibility of digital scrapping for page layouts. There are things you can do with digital that you can't do in traditional scrapping and you never run out of your favorite papers! I like to have both paper and digital options and choose the one that works best for my project. Do you prefer digital or paper? Or a combination of both like I do? Does digital scrapping seem too complicated? In a lot of ways I think it is easier - and definitely faster. 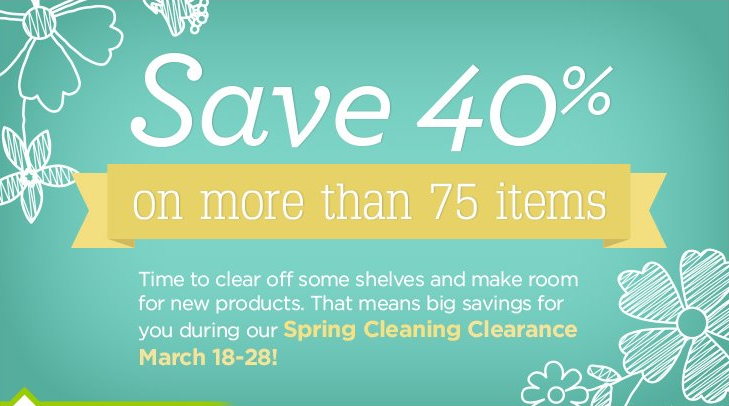 Creative Memories is doing some Spring cleaning and there are a number of items on sale - but they are "while supplies last" and selling fast. 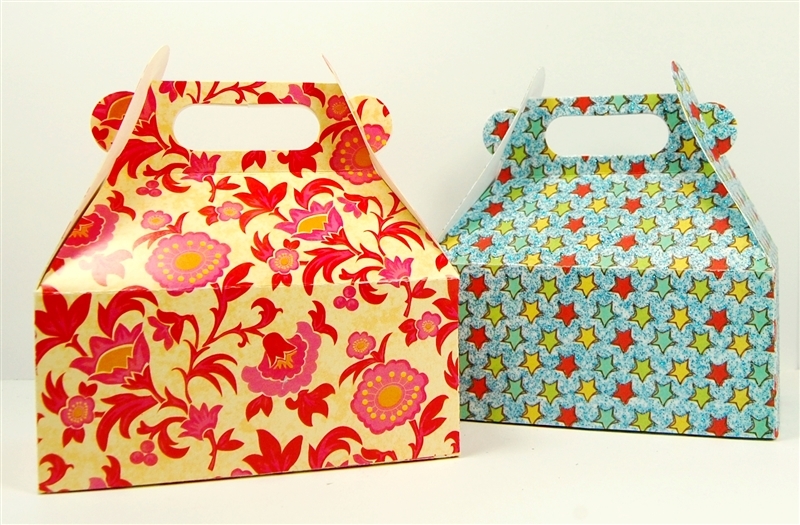 You can see everything that is available on my Creative Memories personal website HERE. Prices are reduced 40% on these items. One item that might be of particular interest is the Stork's Delivery Cricut Cartridge - the sale price is $33 which is a very good price for an exclusive CM cartridge. This cartridge is perfect for baby projects but it also has images that can be used for other projects and some interesting fonts. You can see the "look book" images HERE. 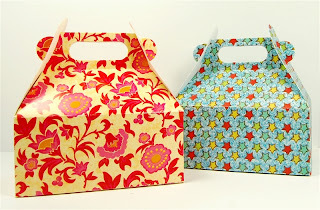 There are also quite a few punches, ink and stamps, papers, embellishments and even a few bags on sale - while they last. The sale ends on March 28th at 10 p.m. Central Time but a number of items have sold out already so you might want to check it out soon. The sale page on my website is HERE and I would be happy to help you if you do not have a local consultant. 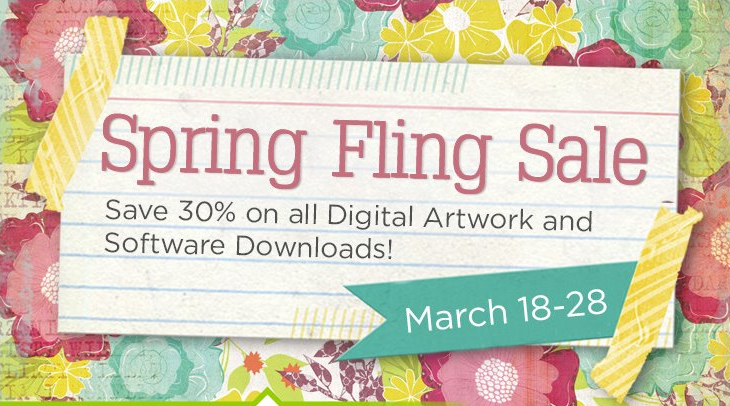 In addition to the spring cleaning sale, there is a "Spring Fling" sale on all Digital Artwork and Software Downloads. You can find this sale HERE. The prices are reduced 30% but the lowered price does not appear on the sale page - you will see it when the item is added to the shopping cart. The digital sale will end on March 28th. The StoryBook Creator 4.0 software download is usually $72.50 but during the sale it is only $50.75 - a great price for this fantastic program. If you already have StoryBook Creator 3.0 you can buy the download upgrade to 4.0 for just $19.95 (regular price is $28.50). All of the digital artwork downloads are also on sale and there are hundreds to choose from. 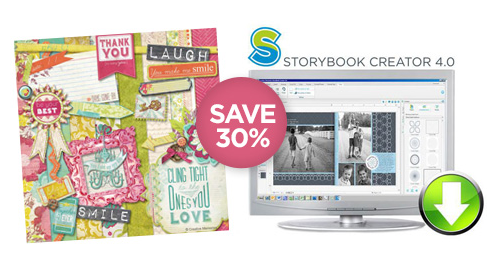 Please let me know if you have any questions about the sale or the digital programs - I have been using these programs for quite a few years now and I find them to be very user friendly with lots of online help available. Our yard is snow covered once again - and there may be more snow tomorrow. But I am going to think "spring-like thoughts" to see if I can make the snow melt faster...wish me luck!